Jim Pullen has written 33 articles so far, you can find them below. Welcome to the Spring Pledge Drive edition of How On Earth. I’m this quarter’s Executive Producer, Jim Pullen. For if we are uncritical, we shall always find what we want: we shall look for, and find confirmations, and we shall look away from and not see, whatever might be dangerous to our pet theories. 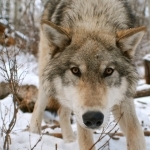 Consider our relationship with the rest of the natural world… Do we humans have a special vitality that sets us apart or can we be best understood as just another smart ape? It’s an essential question. 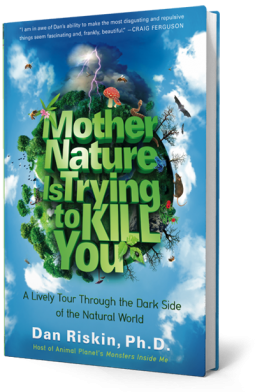 In our feature interview, our guest scientist, bat biologist and Animal Planet host Dan Riskin, challenges us to reconsider–humorously, disgustingly, creepily, scarily–our perceptions of nature. Dan fields questions like, what’s wrong with ‘natural’ marketing? Are killer whales cuddly? Should we feel sympathy for bed bugs? Is a father’s love the same for humans as for water buffaloes? How we can acknowledge nature in its rich complexity and have a just and loving world beyond the grip of natural selection? All this and botfly on the brain. Dan got me thinking–a good thing–and I think he’ll get you thinking too! Your support during KGNU’s pledge drives is critical to keeping us on the air, so a huge thanks to our listener-members who pledged during the drive! If you haven’t yet joined the team, now(!) is the right time to fortify The Show That Makes You Smarter and community radio, KGNU! Pledge securely online at kgnu.org or call 303-449-4885. Pick up one of our great science book thank-you gifts, too. Welcome to a special Radio Nibbles version of How On Earth. Nibbles’ (and pie aficionado) John Lehndorff, chef Ian Kleinman and How On Earth’s Jim Pullen set to work making and eating high-tech delicacies. 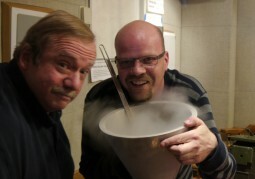 Liquid nitrogen sorbets, strawberries floating above superconducting magnets, and more! Food and tech on the show that makes you smarter. Yum! Quitting smoking (start time 4:39) 50 years ago, the U.S. Surgeon General began a campaign against cigarettes that has saved million of lives. Cohost Jim Pullen talks with Dr. Amy Lukowski about proven strategies to stop smoking and a special quitting campaign for women who are pregnant. Dr. Lukowski is the Clinical Director of the Health Initiatives Programs for National Jewish Health. If you’d like to learn more about kicking the habit, visit the Colorado Quitline. Smoke and children’s health (start time 13:36) It’s been known for some time that breathing in smoke from wildfires — or wood stoves, for that matter — is bad for your health. Many studies have shown that when children are exposed to inhalable particulate matter early in life, their lungs don’t function properly. And the effect on the lungs from inhaling smoke persists as children grow older. But what has not been well understood is precisely what is happening in a person’s body that causes the harmful effects — the biologic mechanism. Also, there is no data available on the long-term impact of exposure to air pollutants on the immune systems of human infants and school children. A new study helps to narrow the gaps in our understanding of the effects of air pollutant exposure early in life. And in fact, the study was conducted on monkeys, not humans. Cohost Susan Moran’s guest is Dr. Lisa Miller, who led the new study. She’s an associate professor in the School of Veterinary Medicine at the University of California at Davis. 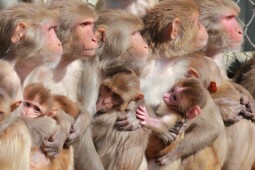 And she is Associate Director of Research at the California National Primate Research Center at the university. 2013 Was a Good Year, in Science! The team considers noteworthy science on the last day of 2013. What’s worth mentioning? Too many people, too much carbon, and way too much fun in astronomy! Biology and Health (start time 00:56). This year marked the passing of long-time Boulder resident, Al Bartlett. Bartlett was one of the world’s most eloquent voices calling for population control. He will be missed. One of the champions picking up the torch is New York Times bestselling author, Alan Weisman. 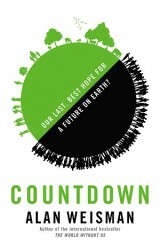 Weisman offers exciting solutions to population growth in Countdown: Our Last, Best Hope for a Future on Earth. How on Earth’s Shelley Schlender reports that this is a hard book to read, because it’s long, and thorough, and urgency of the need for population reduction worldwide is often not a happy topic. She admits that sometimes, she even switched to a detective novel before reading more of Countdown. But she kept at it because Countdown provides some exciting solutions to population growth. One of the most compelling is to provide women with education and access to birth control. It turns out these two offerings are often a key to women deciding, voluntarily, to limit their families to two children, and sometimes, fewer. Co-host Shelley Schlender hosts this interview with Weisman about perhaps the greatest problem facing humanity–too many people. Physics and Astronomy (start time 08:56). Co-host Jim Pullen couldn’t decide on the best physics and astronomy story of 2013, so he dipped into the rich happenings of the year, taken from all over the world: superbolides skipping over Russia, bitumen dripping in Ireland, Voyager 1 long-ranging somewhere in the galaxy, and Icecube spying far-flung neutrinos down at the bottom of the world (and beyond). We’ll learn that the news of 2013 owes much to 2012, 1977, 1944 and even 1927. And that leaves WIMPS, dark matter, LUX, two-dimensional graphene, trapped quantum states, quantum computers, and so much more for 2014! 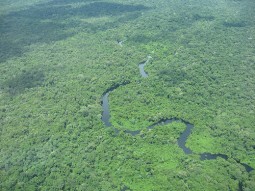 Environment (start time 16:44). What a year it’s been! We shot past 400 ppm of CO2 in the ever-warming blanket of air skinned over the planet. And disasters! Mighty and perilous Super Typhoon Haiyan, with the fastest winds ever recorded, crashed into the Philipines in November. More locally, in September here on the Northern Front Range, a flood of historic proportion. Co-hosts Susan Moran and Tom Yulsman look at the perils of 2013 and portents. Happy 2014 to you, our KGNU and How On Earth family! 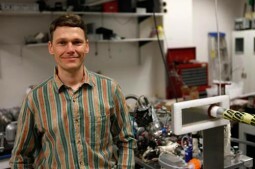 Dr. Steven Pollock, Carnegie Professor of the Year in 2013. Feature 1 – Carnegie Professor of the Year (start time 5:40): Join the KGNU How On Earth team and CU physicist and Carnegie Teacher of the Year Dr. Steve Pollock to learn about the pain and pleasure of learning physics. Pollock teaches both upper and lower division physics classes, and according to a former student and oceanographer who now teaches at Front Range Community College he is “a huge bundle of energy!” Faculty from four institutions are given the Carnegie Award each year. At CU, Pollock joins physicist and Nobel-prize winner Carl Wieman, who was honored by Carnegie in 2004. Dr. Chelsea Stephens in Utah. 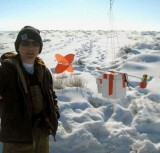 Feature 2 – Oil and Gas Air Pollution (start time 14:48): CU atmospheric chemist Dr. Chelsea Stephens shares what she’s learning about air pollution near Front Range oil and gas wells. That’s especially timely now that the state is reconsidering its oil and gas air quality regulations. Feature 1: (start time: 03:45) Our first guest is Boulder beekeeper Tom Theobald. He talks about the current state of the bee crisis and what, if anything, the EPA is doing to address concerns that systemic pesticides like Clothianidan are properly controlled. 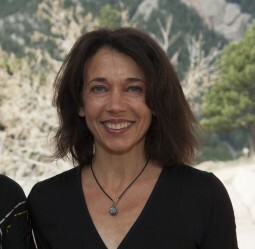 Feature 2: (start time: 12:42) Then National Center for Atmospheric Research scientist Dr. Claudia Tebaldi joins us. Tebaldi, a statistician, specializes in long-term modeling of climate change. We talk to her about the relationship between flood and the warming planet. We also talk about the new Intergovernmental Panel on Climate Change report which she helped lead. She also explains what the ‘fog of prediction is. On Tuesday, August 13th, the US Court of Appeals-DC Circuit ordered the Nuclear Regulatory Commission to evaluate the application for the Yucca Mountain Nuclear Waste Repository. Dr. Bill Alley and Rosemarie Alley talk with us about the significance of the decision. 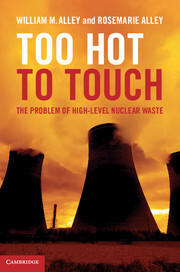 The Alley’s just published Too Hot To Touch: The Problem of High-Level Nuclear Waste with Cambridge University Press. They were also our guests on August 13th’s How On Earth! Today we’re joined by Dr. William Alley and Rosemarie Alley to learn about the nuclear waste crisis in the United States. Bill Alley, a distinguished hydrologist, was in charge of the USGS’s water studies at Yucca Mountain from 2002 until 2010, when the Obama administration ended the project. Rosemarie Alley is a writer and educator and is passionate about the nuclear waste issue. Together, they’ve written a highly readable and informative book published by Cambridge University Press in 2013: Too Hot To Touch: the Problem of High Level Nuclear Waste. The Alley’s also discuss the Ft. St. Vrain Independent Spent Fuel Storage Installation near Platteville, where 15 MTHM (metric tons of heavy metal) are housed until a more permanent home can be found. We’ll be bringing you more on the Ft. St. Vrain facility later in the year.